I’ve been doing a ton of dehydrating this week! There is so much fresh fruit in season right now, it would be crazy to not capture all of this nutrition and flavor for the colder months! Come along and let me show you how to dehydrate fruit! Food preservation is such a critical skill to learn! Of all the ways I know how to preserve food, dehydrating is by far the most simple! First of all, you’re going to need a good dehydrator. I own and recommend the Excalibur Dehydrator wholeheartedly! 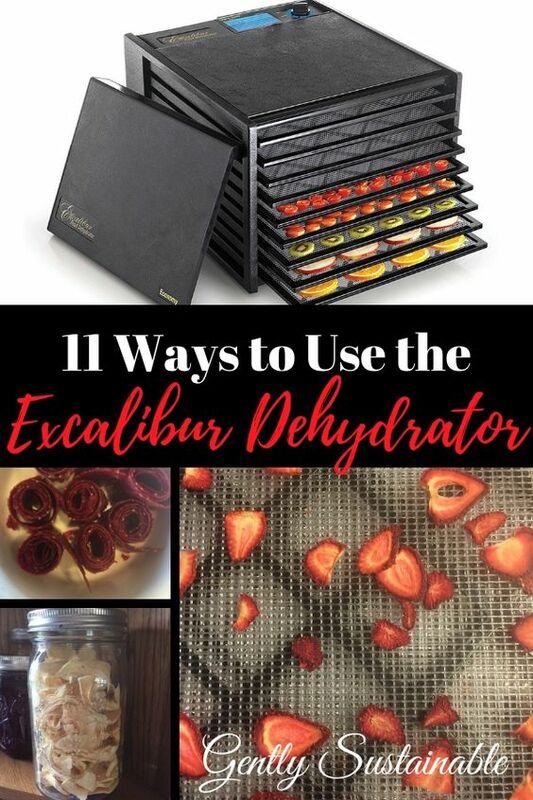 You can read my review and the “11 Ways to Use the Excalibur Dehydrator” here. So, I have two pear trees on my property. They were the very first fruit trees that I planted when we moved here, and they produce a boatload of pears every year! When the kids were younger, I used to can the pears, as well as make a lot of pear sauce. However, the kids are a bit older, things change and now I do a lot more dehydrating with them. 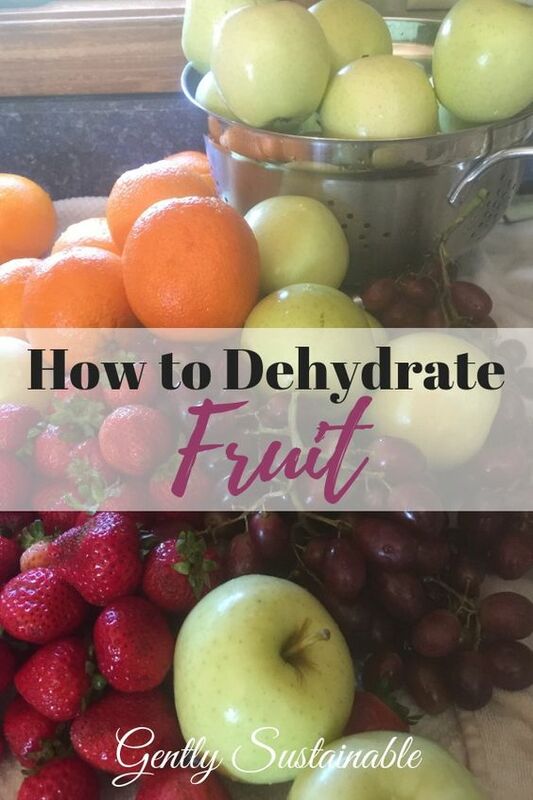 Dehydrated fruit makes for a great snack to munch on at home or when you’re running out the door! Dried fruit also makes a great addition to your baking, whether it be a quick bread or cookies. You can even reconstitute your dried apples and make a quick pie! How cool is that? I love how quick and easy it is to dry fruit! It’s pretty much pick, wash, peel, slice and turn on your Excalibur! Most fruit will not require blanching, although vegetables will. Fruit with a tough skin, like grapes, cranberries and plum will benefit from blanching, as the heat with break the skin and allow the moisture to escape more easily, and thereby reduce drying time. Blanching is simply a pre-treatment of food by boiling them in water for a short period of time. But again, this is not usually necessary when drying fruit. When I saw grapes and apples on sale at the store this week, I just knew they were destined to be dried! I chose not to blanch my grapes, I simply sliced them to help with the drying time. Just wash, slice and place on trays! Easy! The dried grapes (or I’ll use the term “raisins” here, loosely) taste wonderful in oatmeal or right out your hand! You can dry most any fruit with this simple method, there really isn’t anything complicated about it! Just make sure that you slice your fruit thin, from 1/4″ to 3/8″. Wait, did I mention fruit leather? Fruit leather is such a fun project, especially when you mix flavors together! When dehydrating, remember that the food on the outsides of the tray will dry a bit faster than food placed at the center of the tray. So, when making fruit leather, make sure that you spread the liquid a bit thicker towards the edges so that it doesn’t dry out and crack. The middle should be 1/8″ thick and the edges should be closer to 1/4″ thick. Don’t you love the Excalibur’s 15″x15″ sheets? I can get a ton of fruit on them! All I did was wash them, cap, put in blender until liquid and pour them on my handy-dandy non-stick sheets, made for the Excalibur! In just a few hours, I had beautiful strawberry fruit leather for the kids after school! Here’s the Excalibur Dehydration Guide in PDF for all of your drying! When your fruit is completely dried and cooled, place it in an air tight container and label. I like to use mason jars, but you can use zip-lock bags if you prefer. Properly dried fruit will re-hydrate well, practically to their original size! To reconstitute fruit, place one part water to one part dried fruit in a saucepan and let simmer until tender.